New Uruguay 1859 120c blue, thin figures of value fine 4 margined fine used. 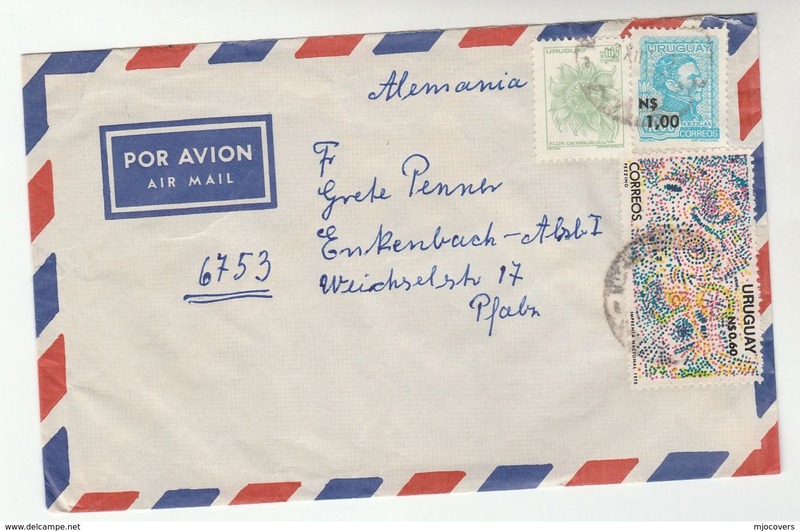 New Uruguay 1933 Columbus Departure mounted mint. 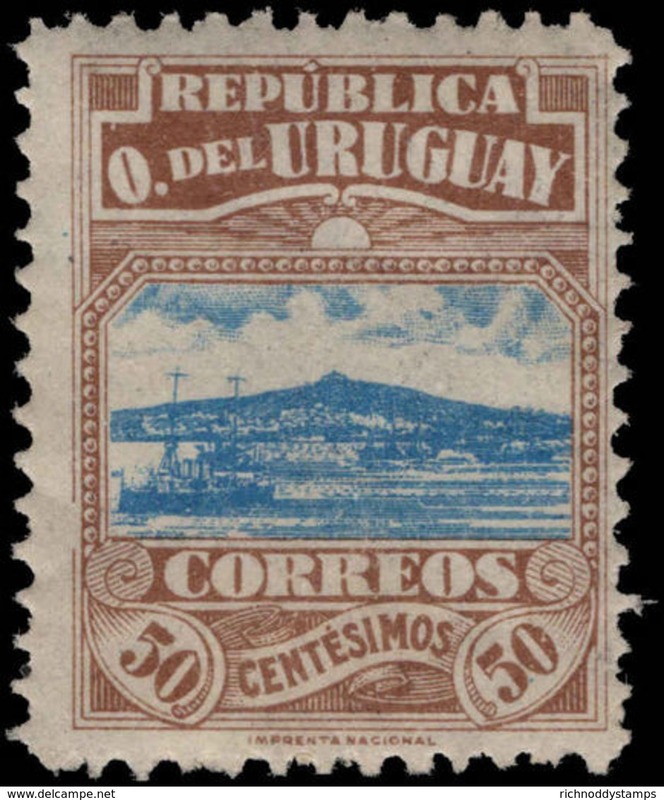 New Uruguay 1929-33 10p deep lake Waterlow fine fine used. 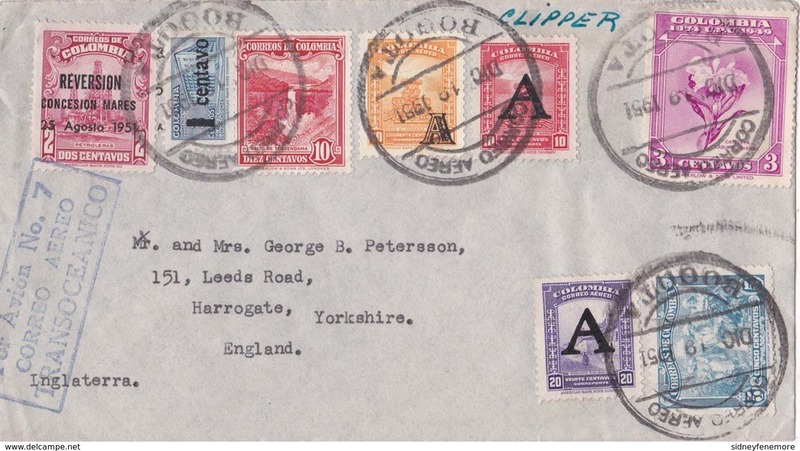 New Uruguay 1929-33 10p deep lake Waterlow fine mounted mint. 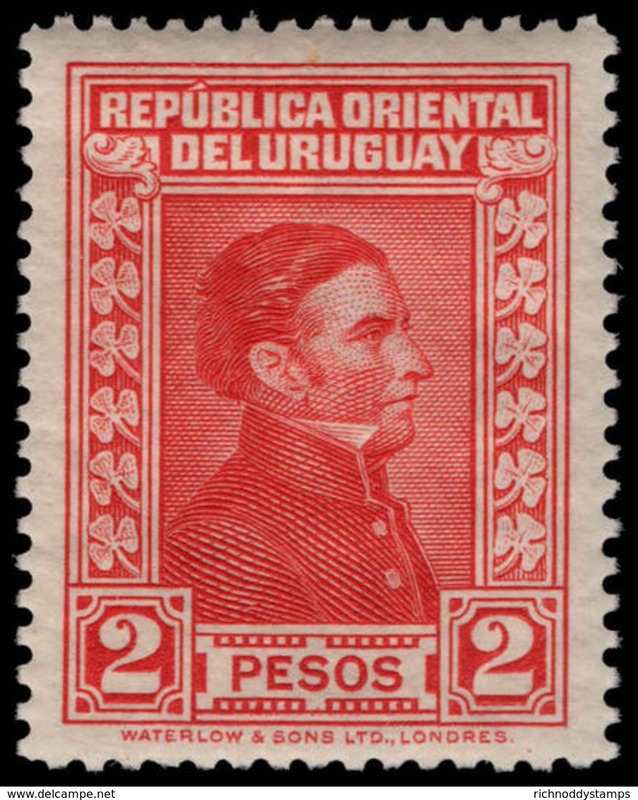 New Uruguay 1929-33 5p vermillion Waterlow fine fine used. 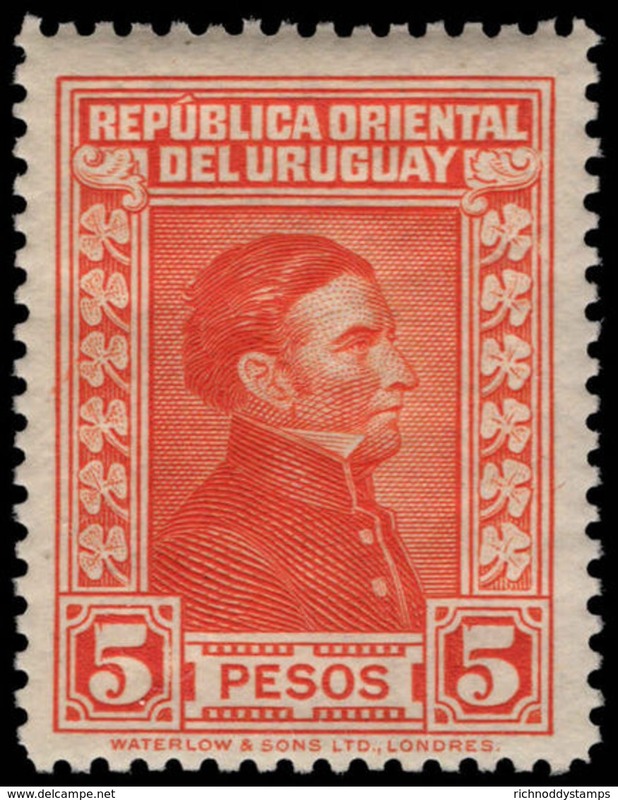 New Uruguay 1929-33 5p vermillion Waterlow fine mounted mint. New Uruguay 1929-33 4p deep green Waterlow fine fine used. New Uruguay 1929-33 4p deep green Waterlow fine mounted mint. 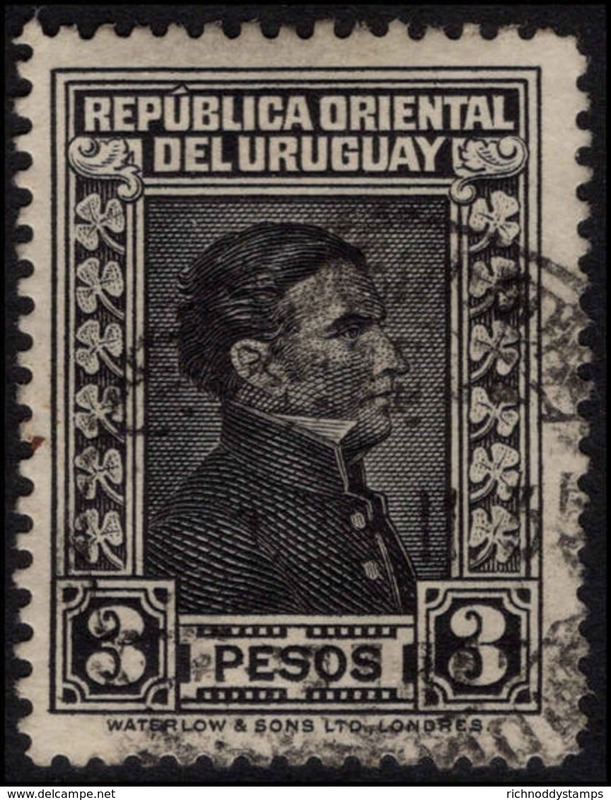 New Uruguay 1929-33 3p black Waterlow fine fine used. New Uruguay 1929-33 3p black Waterlow fine mounted mint. 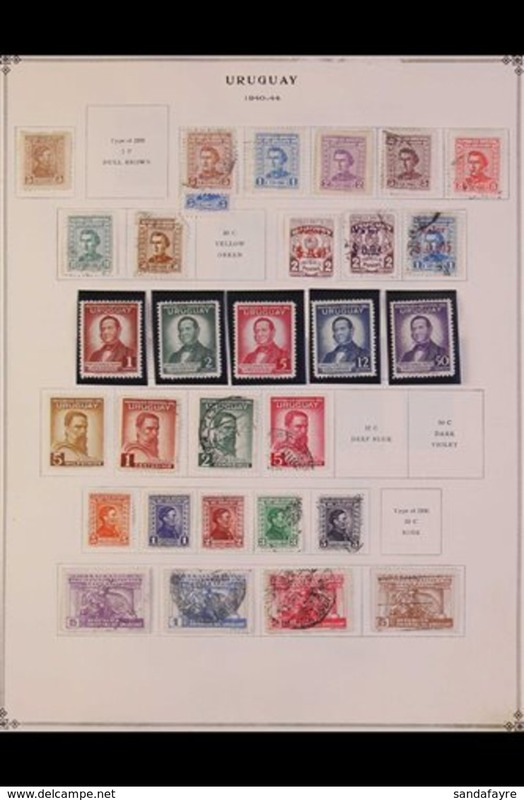 New Uruguay 1929-33 2p scarlet Waterlow fine mounted mint. 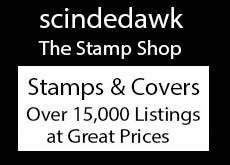 New Uruguay 1929-33 1p brown Waterlow fine used. 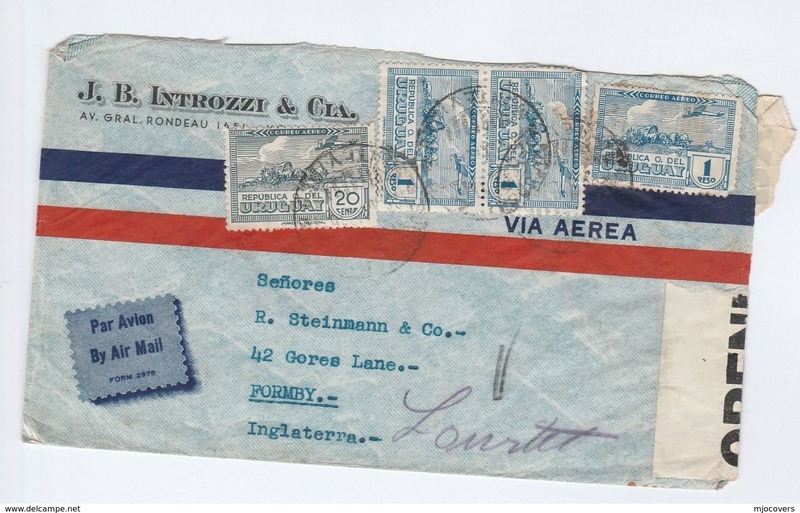 New Uruguay 1932 Zorilla de San Martin mounted mint. 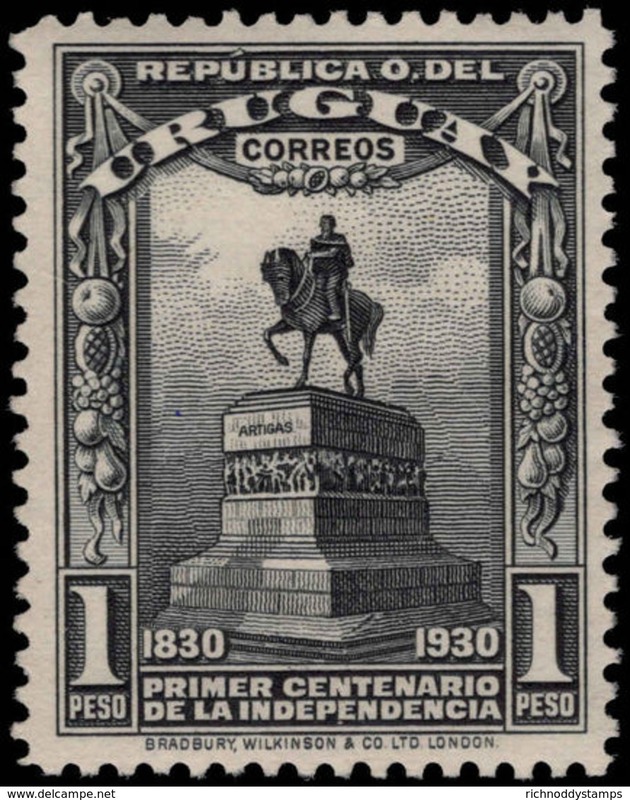 New Uruguay 1930 1p Artigas Monument mounted mint. 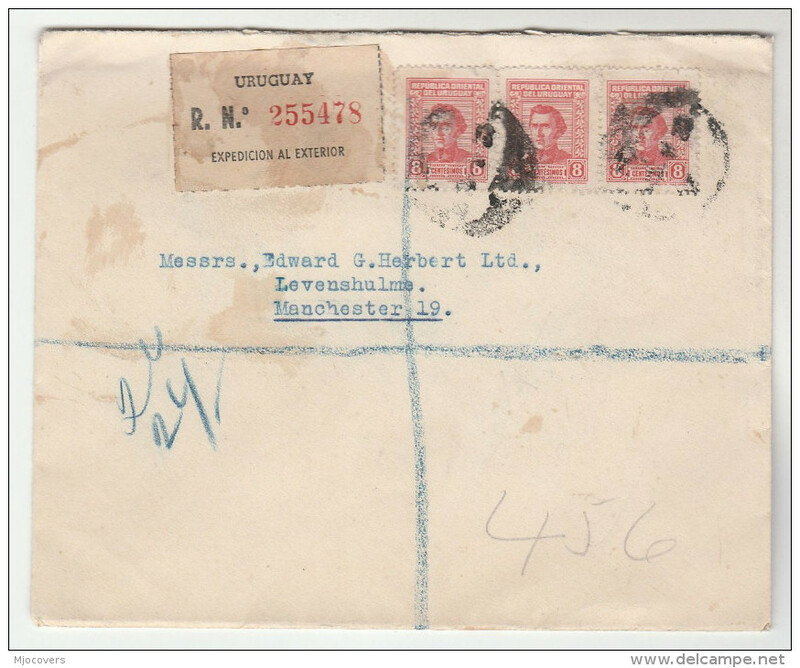 New Uruguay 1928 General Garzon mounted mint. 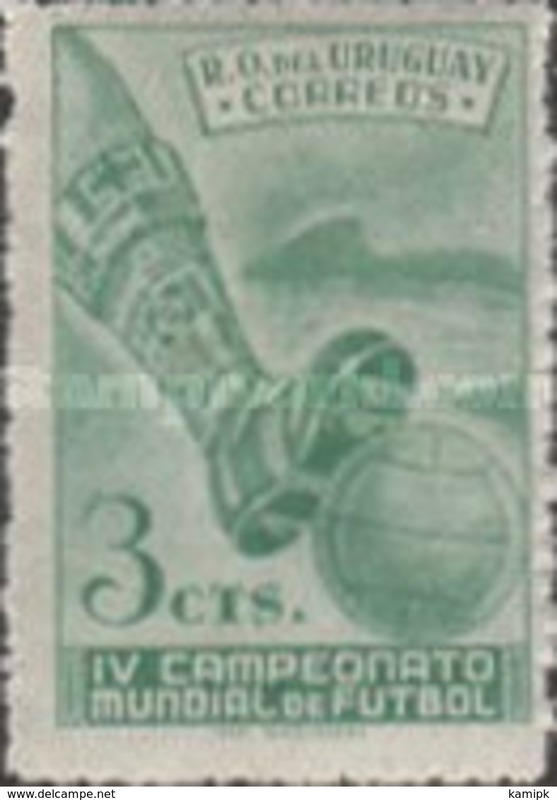 New Uruguay 1928 Uruguayan Football Victories unmounted mint. 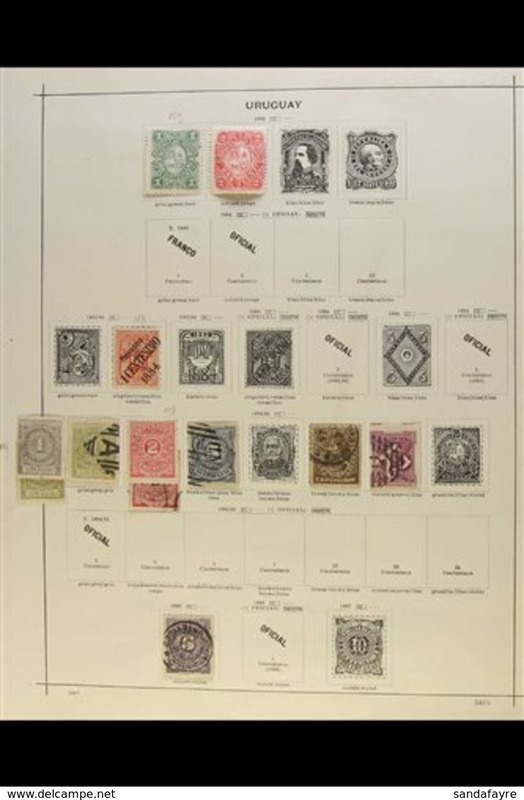 New Uruguay 1927 Philatelic Exhibition mounted mint. 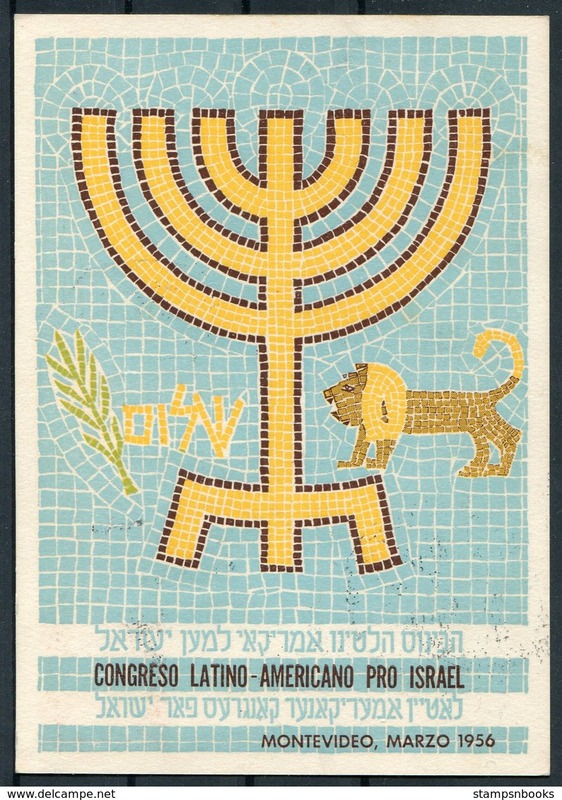 New Uruguay 1933 Third Assembly mounted mint. New Uruguay 1925 Battle of Sarandi fine used. New Uruguay 1925 Battle of Sarandi unmounted mint. New Uruguay 1925 Parliamentary House mounted mint. New Uruguay 1925 Uprising mounted mint. 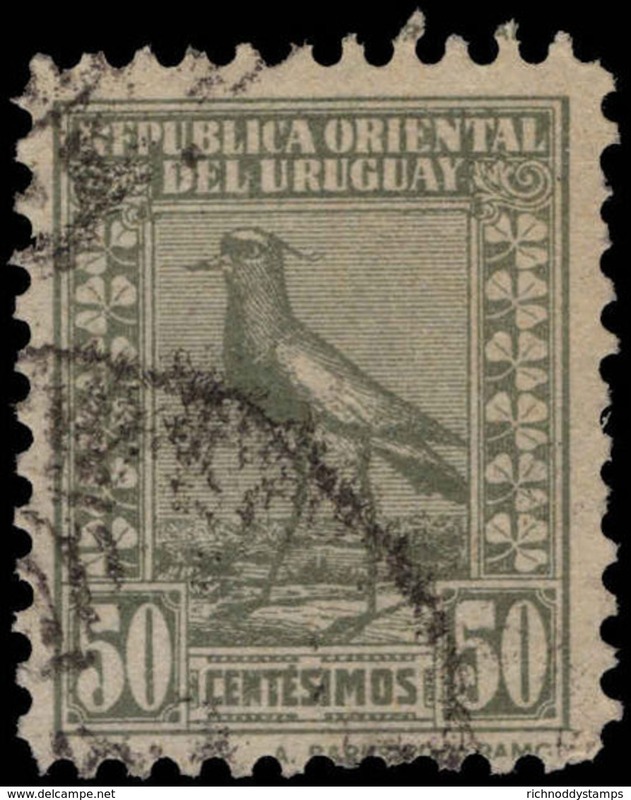 New Uruguay 1924 50c grey-olive perf 11½ Chilean Lapwing, Barrios imprint fine used. 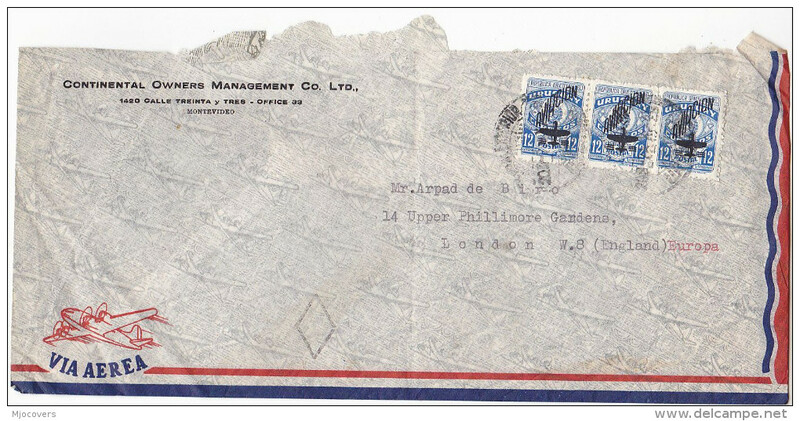 New Uruguay 1923 Battle of Sarandi on First Day piece. New Uruguay 1923 Monument to Artigas mounted mint. 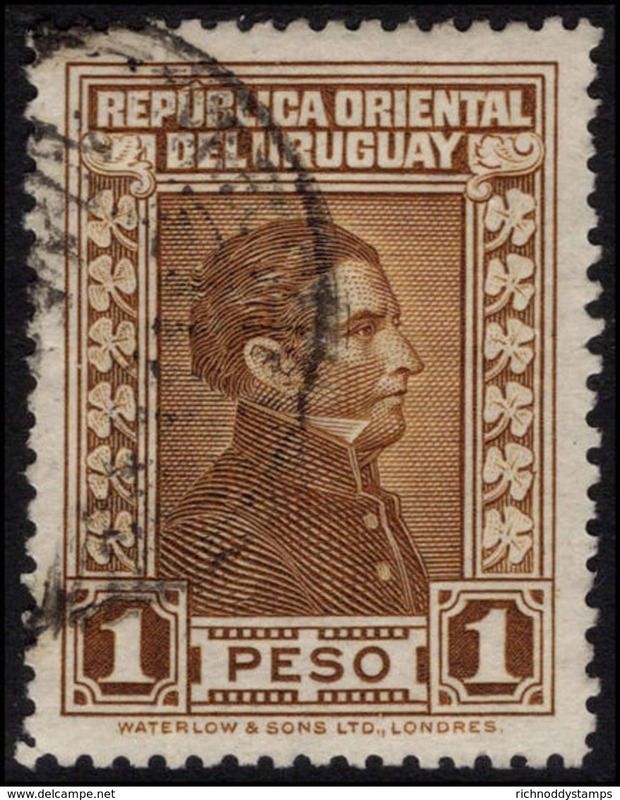 New Uruguay 1921 Damaso Larranaga unmounted mint. New Uruguay 1919 Montevideo Harbour 50c mounted mint. 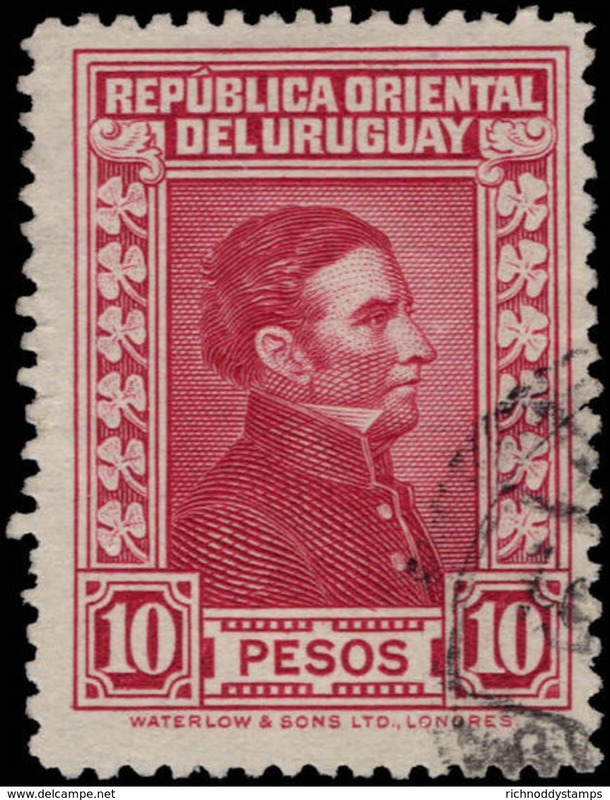 New Uruguay 1918 New Constitution unmounted mint. 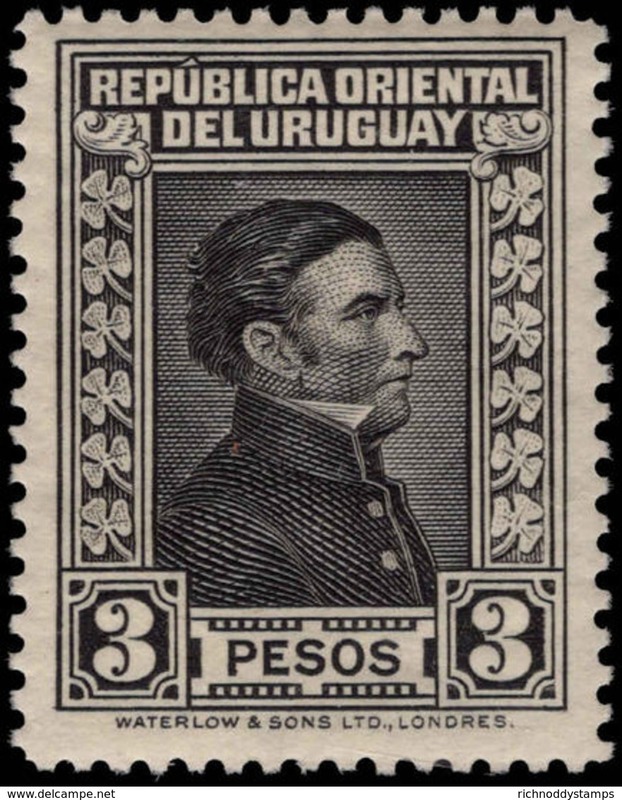 New Uruguay 1913 1813 Conference mounted mint. 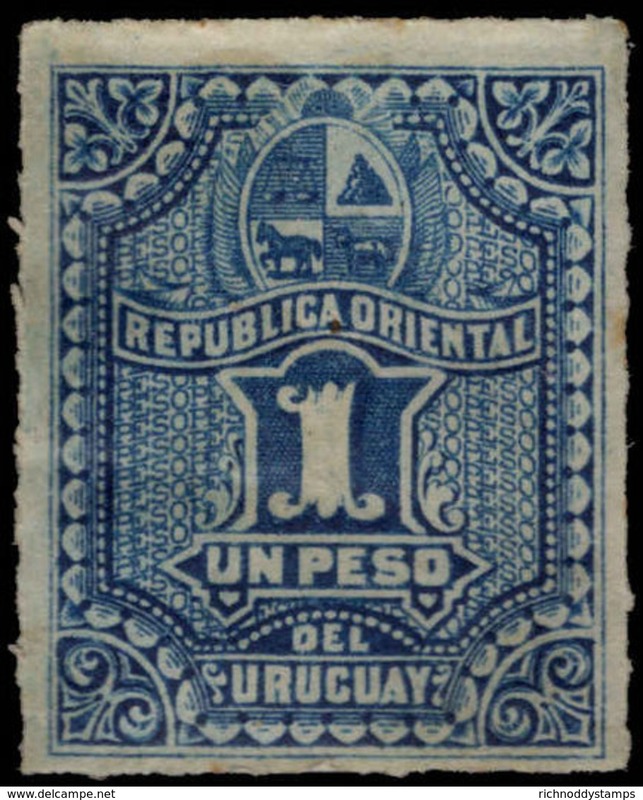 New Uruguay 1909 Montevideo Port fine used. New Uruguay 1909 Montevideo Port heavily mounted mint. 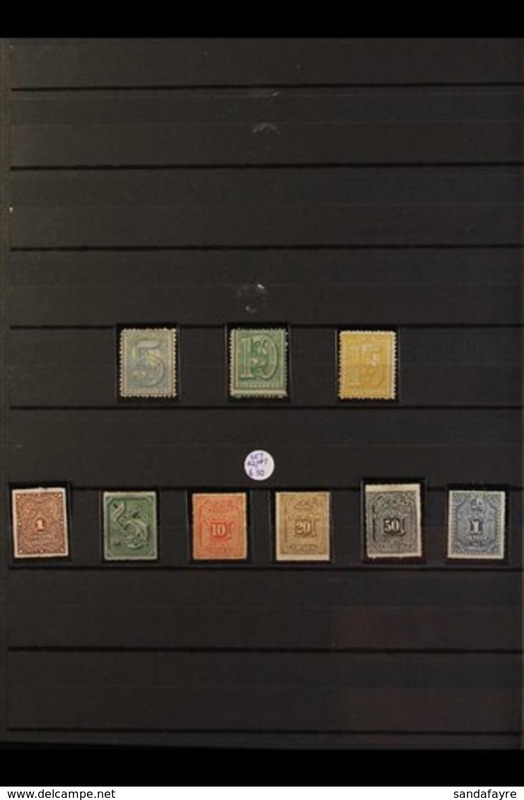 New Uruguay 1877-79 1p blue mounted mint. 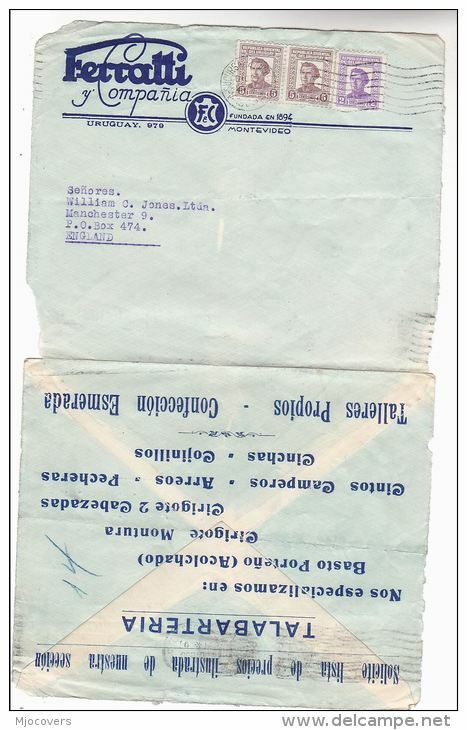 Uruguay 1997 Uprising souvenir sheet unmounted mint. Uruguay 1997 Insanitary Rural Housing unmounted mint. 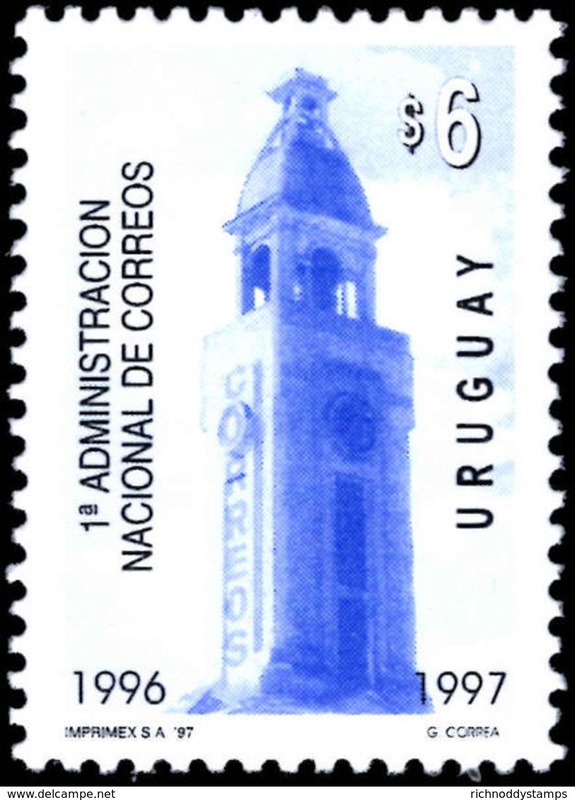 Uruguay 1997 Construction unmounted mint. Uruguay 1997 Uruguay Post Office unmounted mint. Uruguay 1997 Supreme Court unmounted mint. 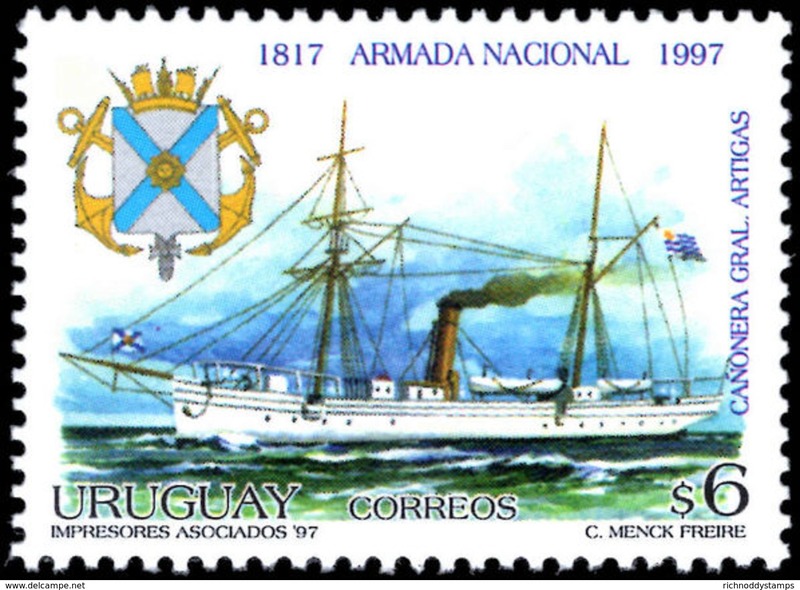 Uruguay 1997 Naval Academy unmounted mint. Uruguay 1997 Indepex unmounted mint. 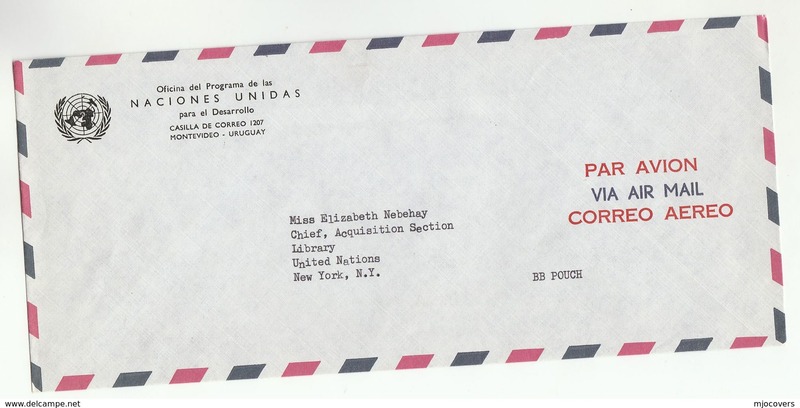 Uruguay 1997 Philatelic audio-visual systems unmounted mint. Uruguay 1997 Sportsmen unmounted mint. Uruguay 1997 Christmas unmounted mint. Uruguay 1997 Spanish Writers souvenir sheet unmounted mint. 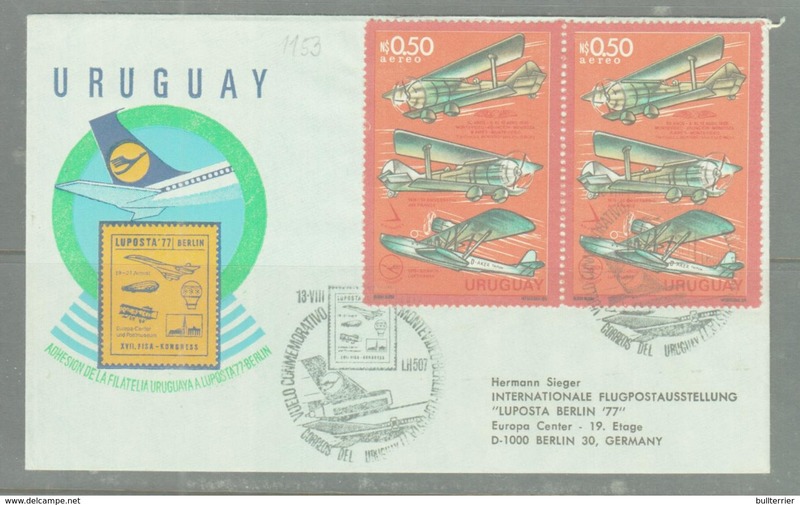 Uruguay 1997 Shanghai Internationl Exhibition souvenir sheet set unmounted mint. 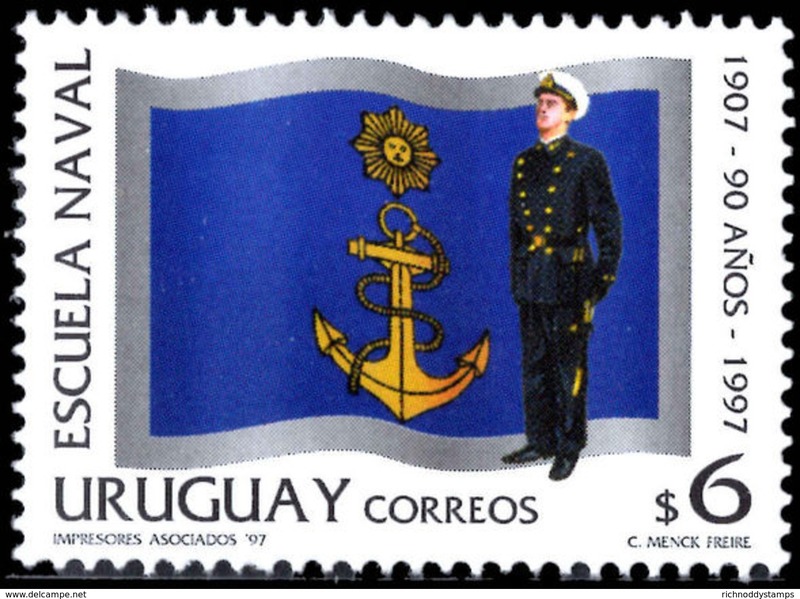 Uruguay 1997 Navy unmounted mint. Uruguay 1997 Pope John Paul souvenir sheet unmounted mint. Uruguay 1997 Paintings Biennial unmounted mint. Uruguay 1997 Aeronautical and Space Congress unmounted mint. Uruguay 1997 Casa de Galicia unmounted mint. Uruguay 1997 Domingo Laporte unmounted mint. 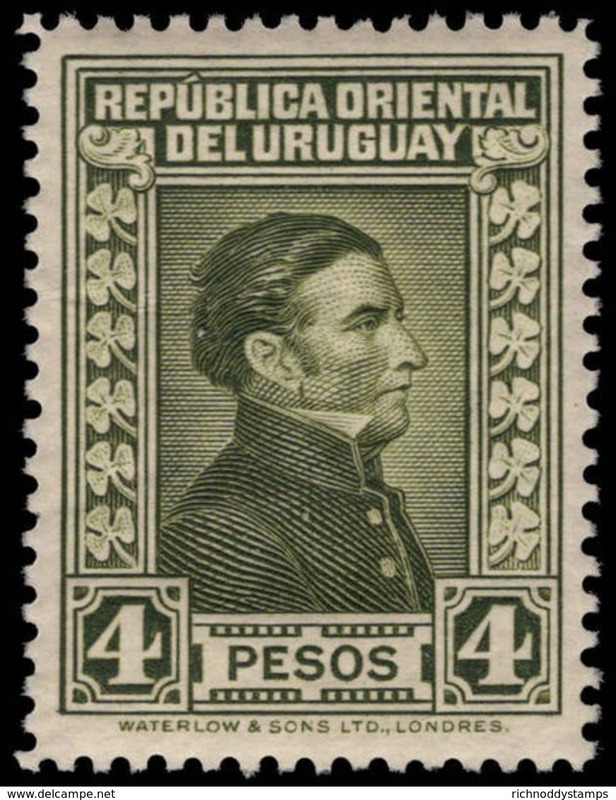 Uruguay 1997 Artigas Scientific Base unmounted mint. Uruguay 1997 America. Postal Delivery unmounted mint. Uruguay 1997 von Stepan unmounted mint. 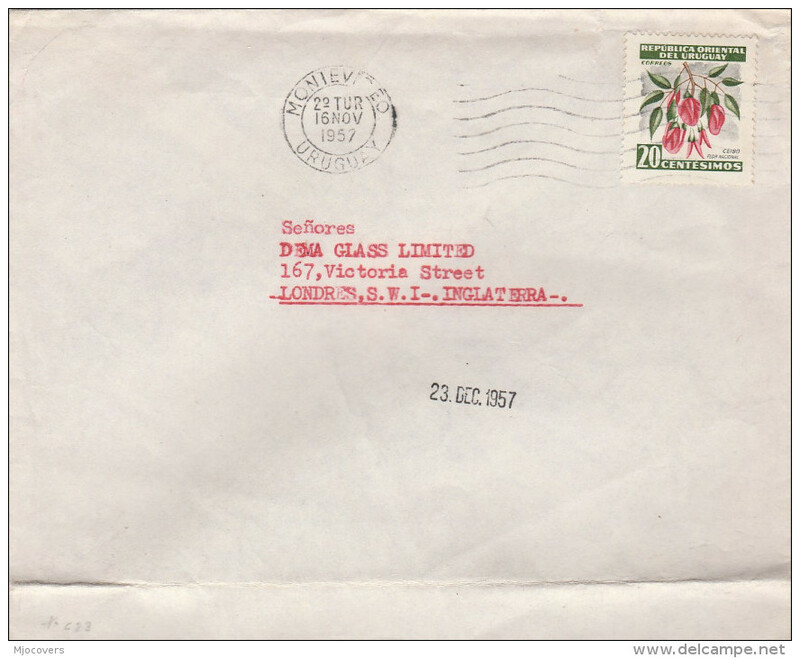 Uruguay 1997 Mercosur, Passion Flower souvenir sheet unmounted mint. Uruguay 1997 Mercosur unmounted mint. Uruguay 1997 Composers unmounted mint. 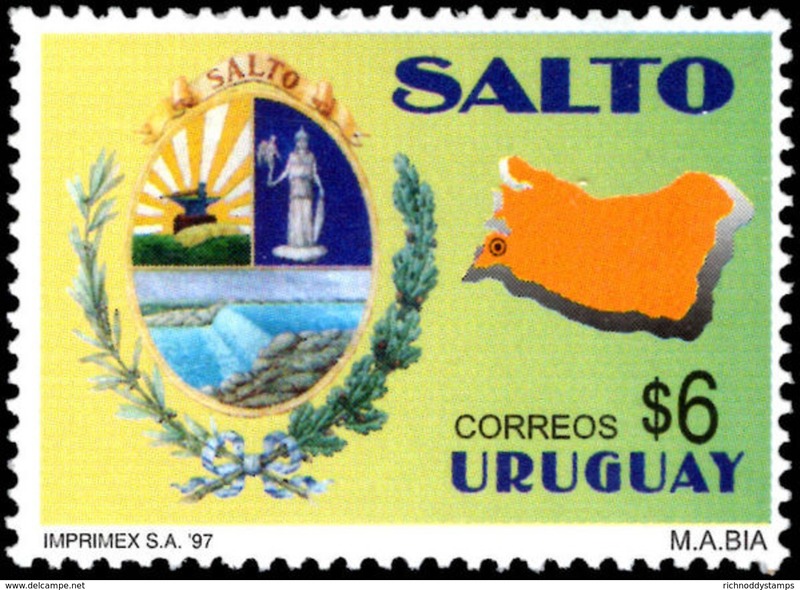 Uruguay 1997 Salto unmounted mint. 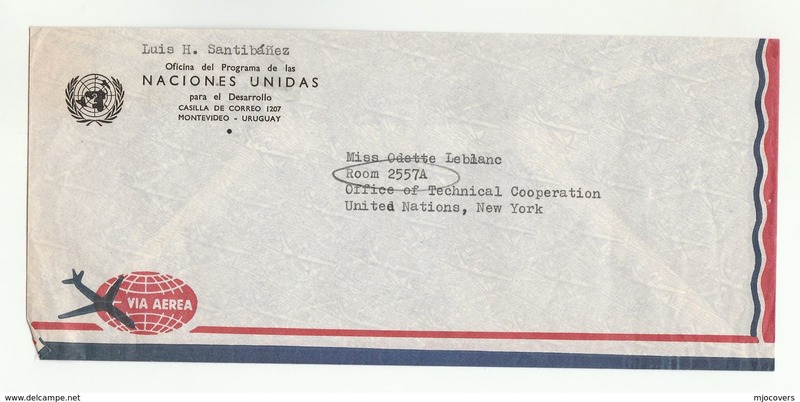 Uruguay 1997 First National Administration of Posts unmounted mint. Uruguay 1997 Aspirin unmounted mint. 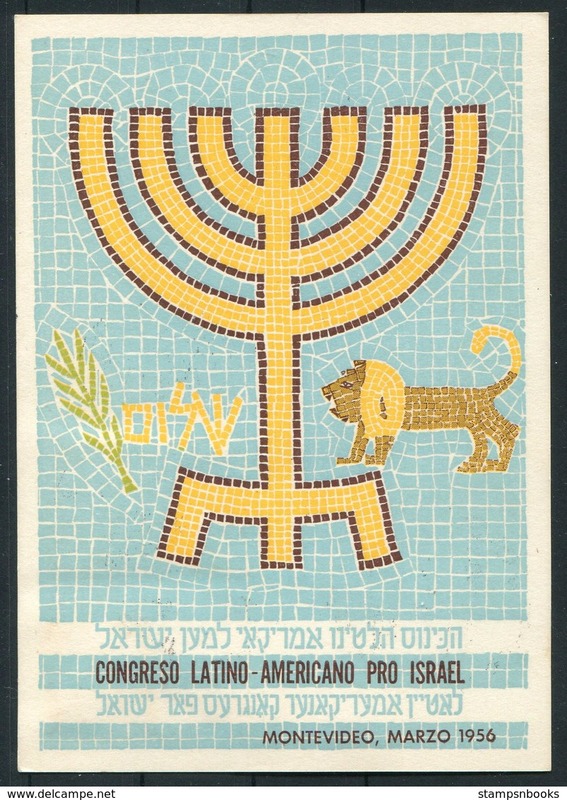 Uruguay 1997 Zionist Congress unmounted mint. Uruguay 1997 Colonia del Sacramento unmounted mint. 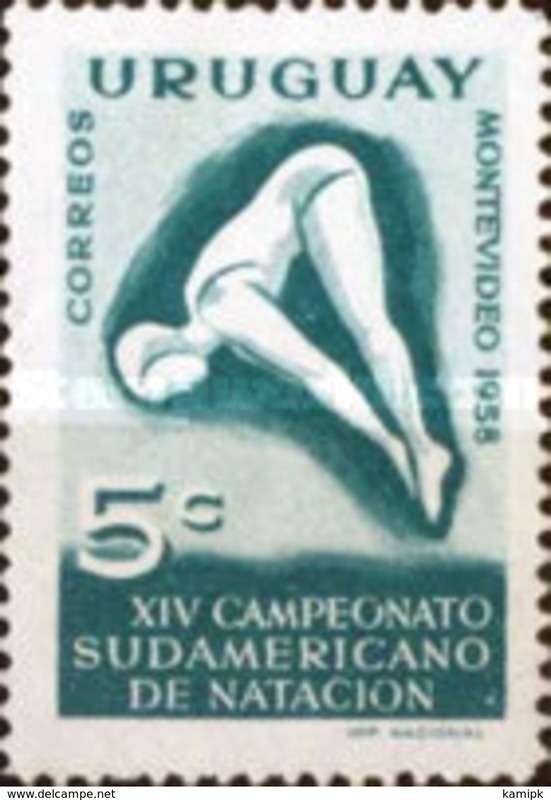 Uruguay 1997 Punte del Este unmounted mint. Uruguay 1997 Comic Strip Characters unmounted mint. Uruguay 1997 Inter-American Institute for the Child unmounted mint. Uruguay 1997 Teatro Maccio unmounted mint. Uruguay 1997 Youth Philately unmounted mint. Uruguay 1997 Black Skimmers unmounted mint. 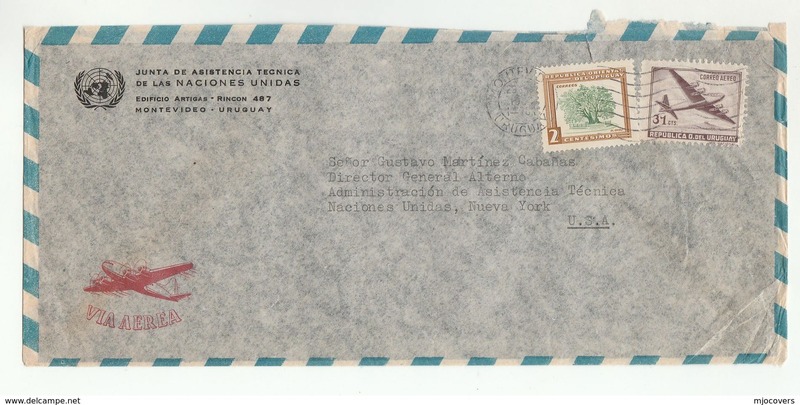 Uruguay 1997 Dioceses unmounted mint. Uruguay 1997 Natural History Museum unmounted mint. Uruguay 1997 Artigas Central Station unmounted mint. Uruguay 1997 Festivals unmounted mint. Uruguay 1997 Yachting Harbours unmounted mint. Uruguay 1996 Postal Emblems unmounted mint. Uruguay 1997 Fishes unmounted mint. Uruguay 1997 Artigas Lancers unmounted mint. Uruguay 1997 Artigas Military Academy unmounted mint. 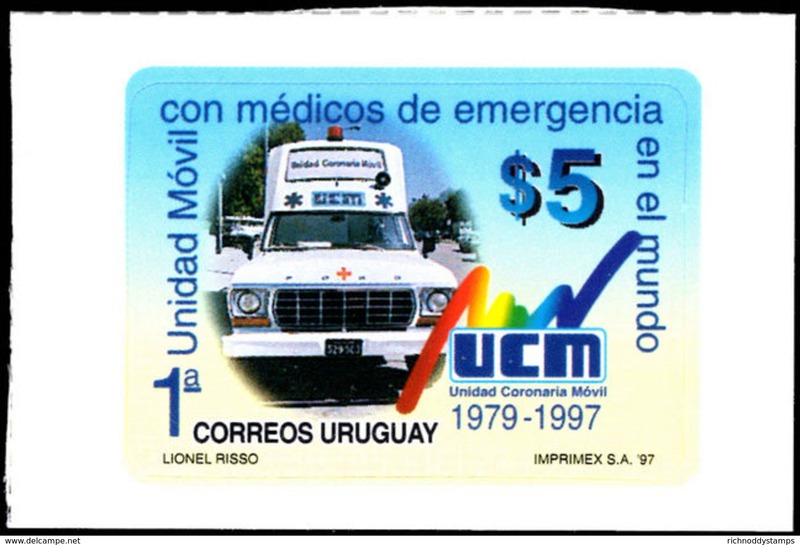 Uruguay 1997 Coronary Mobile Unit unmounted mint. Uruguay 1997 UNICEF unmounted mint. Uruguay 1997 Lighthouses unmounted mint. Uruguay 1997 Prehistoric Animals unmounted mint. Uruguay 1996 Seventh Day Adventist Church unmounted mint. Uruguay 1996 Felix de Azara unmounted mint. Uruguay 1996 Centenary of Hygeine Institute unmounted mint. Uruguay 1996 Centenary of Comics unmounted mint. 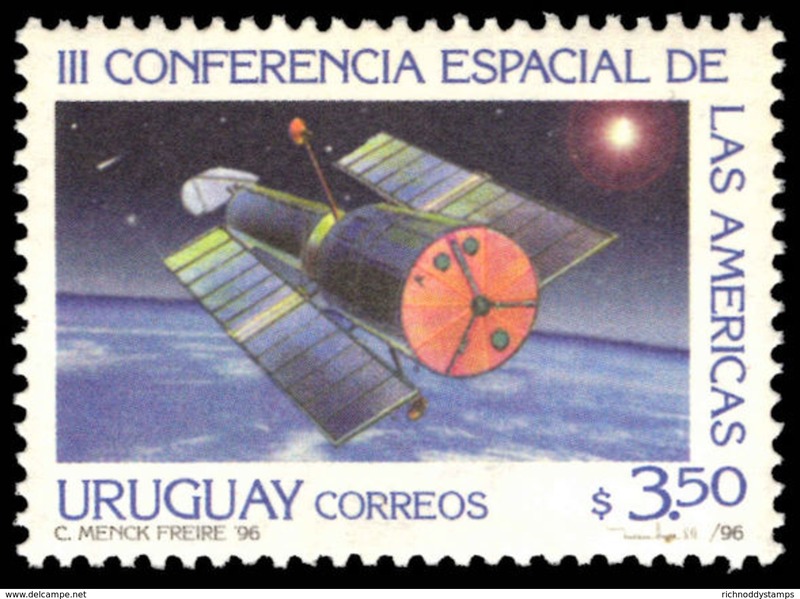 Uruguay 1996 Third Space Conference unmounted mint.